Robyn S. Martin is a contributor to Writers on the Range, the opinion service of High Country News. She is a senior lecturer in the Honors College at Northern Arizona University in Flagstaff. Something remarkable happened in my hometown of Flagstaff, Arizona, this summer: We agreed on something. 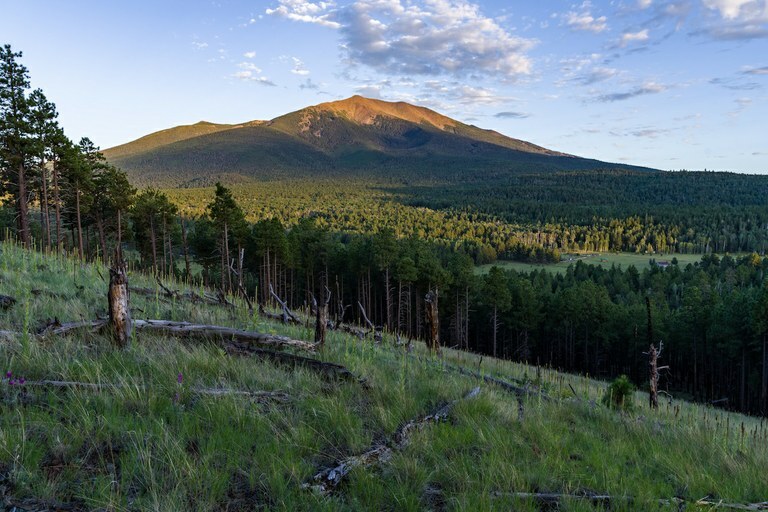 The San Francisco Peaks in Northern Arizona’s Coconino National Forest are popular for hiking and other recreational activities. Environmentalists didn’t complain that recreation was being stifled, and businesses didn’t vilify the federal government for overreaching. That’s because we all know exactly where we live. Flagstaff lies in the middle of the largest ponderosa pine forest in the world. Visitors from all over the country, including elsewhere in Arizona, vacation in our backyard, and more come every year. In the winter and spring, winter sports are popular. In the summer and fall, it’s camping, hiking, biking and many other activities. We find solace in the mountains year-round and enjoy star-filled skies and quiet. And yet we agreed that shutting ourselves out of the forest we love made sense. The evidence had mounted: According to a 2018 article in the Arizona Republic, Arizona has been in a drought for two decades, and this past winter was the driest on record. Flagstaff averages at least 100 inches of snow a year, yet by May 19 we had received just 38 inches. Businesses that rely on snow-loving visitors — skiers, snowboarders and the like — were hit hard by drought this winter, and they had hoped to make up for lost profits this summer. By May 22, however, six large areas of the Coconino National Forest were completely closed to the public. Locals understand the risky relationship we have with this forest. Thousands of residents live along what’s called the urban-forest interface. We understand that wildfire can attack neighborhoods, quickly leapfrogging from structure to structure with devastating outcomes. We all also understand that we’re in a serious drought. Flagstaff, lacking perennial rivers or streams, relies on reservoirs and wells for water. Snowmelt fills both. We were frustrated this winter when we watched sparse, weak storms roll in, drop a few inches of snow and then leave. By early spring, it was obvious. Logic told us one spark from a campfire, a cigarette or target practice with a weapon could be our undoing. Flagstaff residents called the Forest Service, asking — even demanding — that the government close our forest. Many of us wrote letters to the local paper, voicing our concern. I think we all felt threatened. We wanted protection for the landscape we love, and we were willing to sacrifice our summer activities for that protection. There’s a Hawaiian proverb that says in order to go forward, one must look back. The catastrophic 2010 Schultz Fire on the San Francisco Peaks burned over 15,000 acres, denuding vegetation and making us vulnerable to flooding and debris flows for years to come. Eight years later, we remember it well, and we know that we must work together if we want a future that includes our forests. As of this writing, we’ve had no major forest fires near Flagstaff. None threatened the city. Fortunately, our monsoons have returned. The forest is open once again. Meanwhile, I’m looking at my neighbors a little differently these days, and I think it’s with pride. We knew the right thing to do, and we did it.